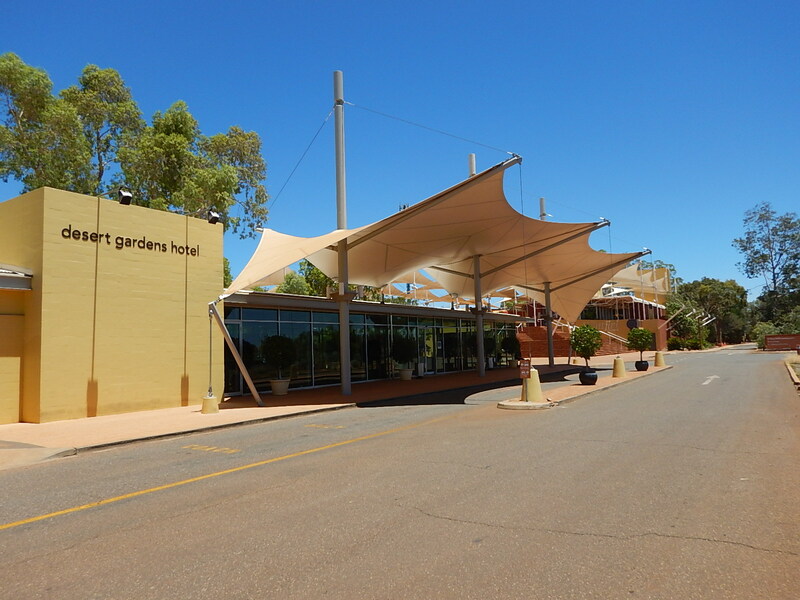 We flew from Adelaide to Alice Springs and then straight on to Ayres Rock, a bus took us to the Desert Gardens Hotel part of the Ayres Rock Resort. 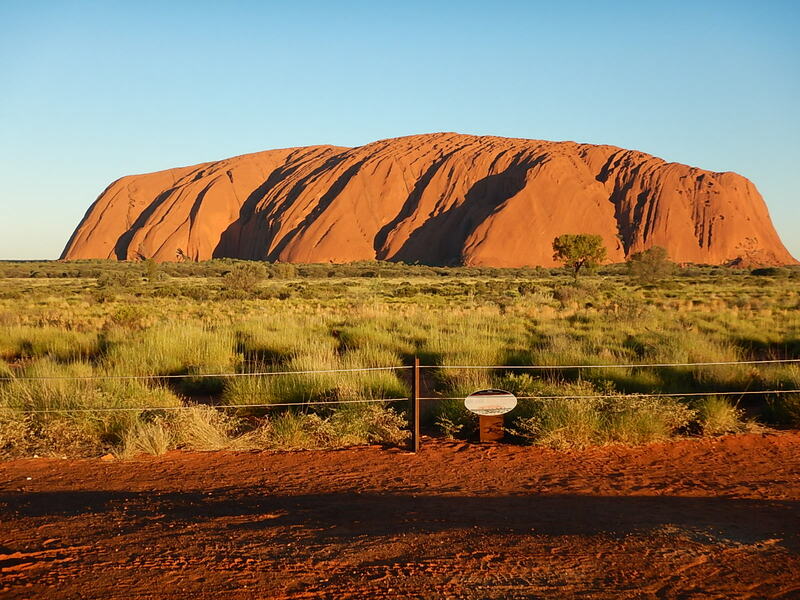 There is no town of any sort near the Kata Tjuta and Uluru National Park, just an airport and the resort which have been built to serve the thousands of tourists that visit every year. The resort has two hotels, apartments and a campsite and a ‘town square’ with a bank, café, supermarket and souvenir shop. There is a very efficient system of buses and mini buses which link the different parts of the resort and ferry visitors on an extensive range of excursions into the desert. As we drove from the airport we were surprised how green everywhere looked, we had expected parched red dirt, apparently after 11 years of drought there has been a very wet winter here and there was unseasonal heavy rain last week (72mm in 36 hours in some places) so the desert has burst to life, this is a very rare site so we are lucky to have timed our visit to coincide. One guide told us that when it rains hard waterfalls run from the top of Uluru, one of her colleagues had seen this happen four times in fifteen years, she has seen it eight times in six months. On our first evening we were booked to attend the Sounds of Silence dinner, I had read about this experience many years ago and it has long been on my bucket list so I was excited to be going and hoping that it would live up to expectations. A bus took us out into the desert and we walked along a path to a viewing platform in between Uluru and its sister rock formation Kata Tjuta; as the sun set next to Kata Tjuta it lit up Uluru in the distance, we were served sparkling wine and canapes while a musician played a didgeridoo as we watched darkness set over the desert. Once it was dark we walked down a path to a dining area in a clearing in the bush, we were seated at tables of eight and served a delicious three course meal with wine and port. In between the main course and desert a local astronomer gave a talk on the night sky pointing out planets and constellations and telling some of the local aboriginal creation stories. It was a lovely experience and certainly didn’t disappoint. 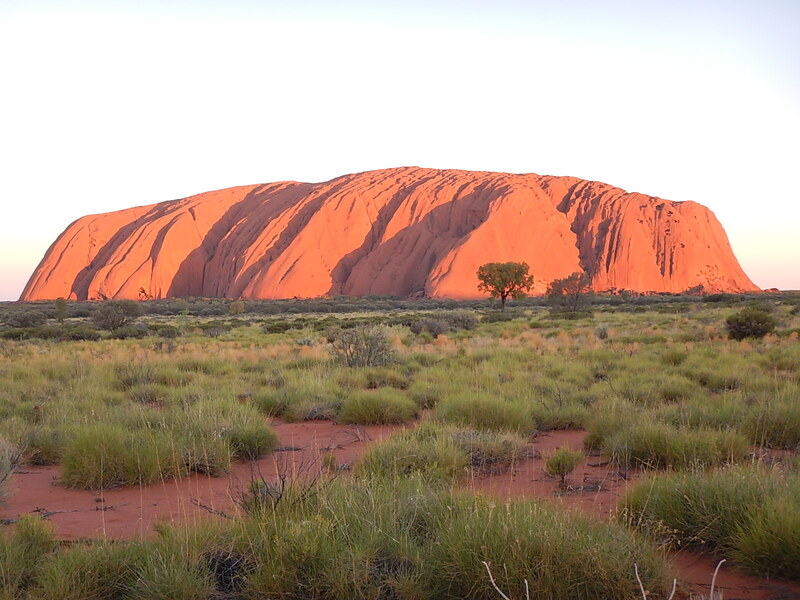 The next day we were due to take two tours, one to see sunrise over Kata Tjuta and the other to watch sunset at Uluru. Both included guided walks to view the rocks close up. The mini bus for Kata Tjuta picked us up at 04.45, yes, 04.45, we had to set our alarm for 04.15!! We set off in the dark and stopped at a viewing platform looking across the desert floor to Kata Tjuta, the moon was quite bright so it was lovely walking the path through the scrub by moonlight. As the sun came up we watched the rocks change colour in front of us with shadows changing the shape of the rocks as we watched. Once the sun had risen flocks of birds appeared as if from nowhere and perched in the bushes and trees to warm themselves in the first rays of the sun. From there we drove to a picnic area where our guide laid out cereal and fruit, toasted raisin bread, and made fresh coffee to wash it down. By the time we finished it was nearly seven o’clock. We drove to the foot of Kata Tjuta and followed a path into a gorge between two of the massive rocks, it was only a narrow gorge and the rock walls on either side were 350m tall. It took us about an hour to walk in and out again pausing along the way to learn about some of the native trees and shrubs. By 9.30 we were back at the hotel and glad to escape the heat which was heading up towards 36⁰C. We kept cool during the afternoon and had some lunch in the hotel restaurant. 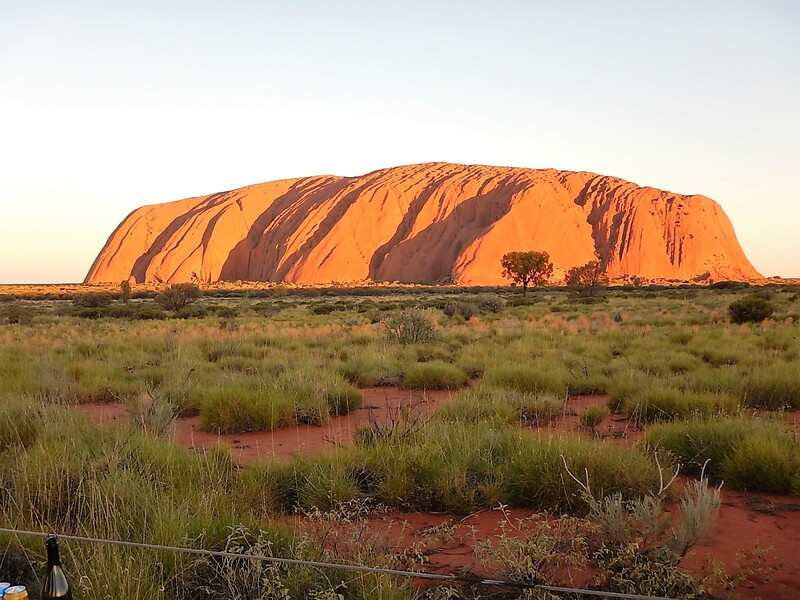 At 15.45 we boarded another mini bus and headed out to Uluru, first stop was a photo opportunity to take the picture of the rock that everyone recognises, the one that makes the rock look very regular and oblong, guess what, Uluru is triangular and that view is its shortest side! 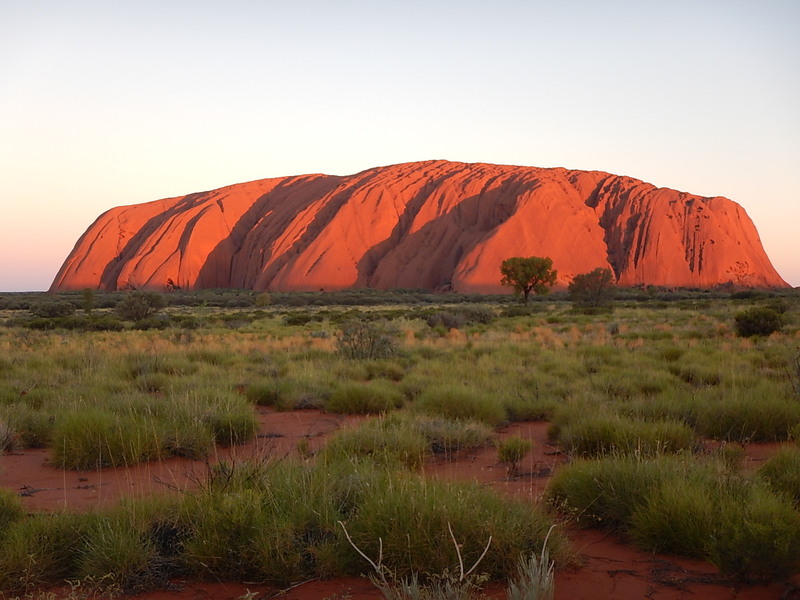 Many places around the rock are considered sacred by the local indigenous peoples and photography is forbidden, that is why we only every see one perspective of the rock. From there our guide took us right around the rock stopping at two places to do short walks into rock ravines to view waterholes nestling at the foot of the rock. She showed us caves and rock paintings and a ‘kitchen cave’ used by women for thousands of years where we could see rocks warn smooth by generations of women grinding seeds for flour. The rock itself was amazing, it is one huge slab with a surface that looks like scales, the red colour is rusting iron deposits in the stone, underneath it is pale grey. We saw two waterholes which were immensely important to the local communities and are still considered sacred. 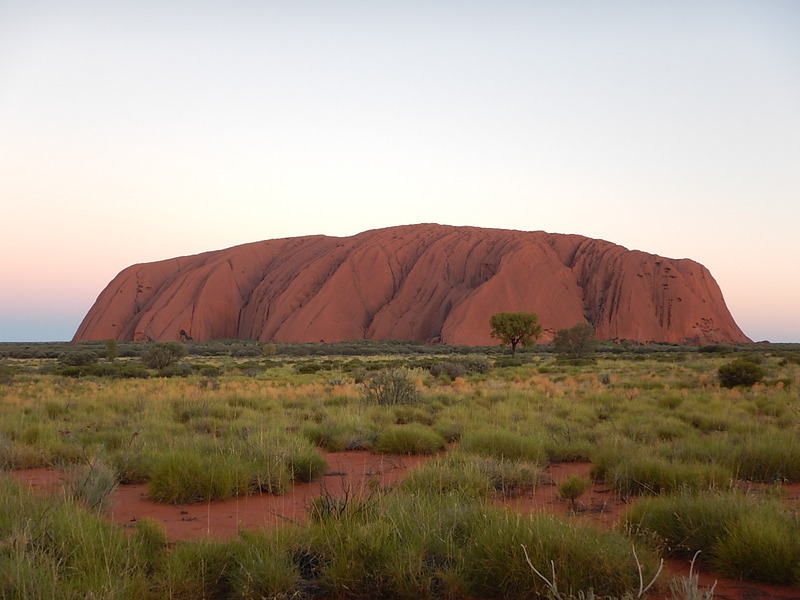 One thing we particularly noticed around Uluru and in the desert around us was that, apart from bird song near the waterholes, it is virtually silent, it is a very moving place to visit – what a privilege. On Monday we were due to transfer to Kings Canyon by bus, we had some time to spare so, after a lie in, we walked down to the town square and had breakfast at a café run as part of a training academy. The academy trains young people from the local indigenous communities to work in the hospitality industry, we had an excellent breakfast and the service was great so they are doing a good job. We spent the last hour before we left taking advantage of the air conditioning and free Wi-Fi in reception, a perfect opportunity to bring this blog up to date!